Just how far around the world do the words of some blogs get? For Scotch Corner, the Scottish daily art blog, it is the Ukraine. Specifically Bakhchisaray School No. 1 in Crimea, Ukraine. Scotch Corner runs a monthly competition to win artwork from each of the five artists involved in the blog. 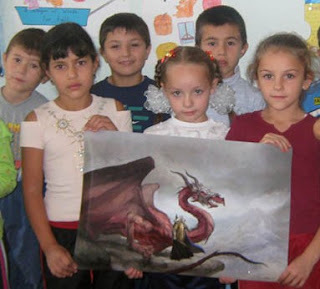 The August competition was for a limited edition print by Jon Hodgson entitled 'Dragon Rein' and it was won by Brian Woods who is a Peace Corps volunteer teacher at the school and who donated the print, and others that were sent with it, to the school. "The students from today were very impressed with the artwork," said Brian. " I told them that maybe today they don't know enough (English) but I hope one day they will write stories about what they see in those pictures!" The current Scotch Corner competition runs until the end of September and the prize is the original artwork for a Star Wars style poster for the Doctor Who story Remembrance Of The Daleks drawn by Graeme Neil Reid as well as the DVD of the story. The Scotch Corner art blog is here. Entry to the September competition is free and details can be found here.